Addresses habits, tendencies and behavioural addictions, including stress disabilities, depression and emotional imbalances. This includes alcohol, drugs, smoking, eating disorders, co-dependency, work, and computers - even attachment to advancement, rejection and worry. The program has been developed for a specialised hospital in the USA where it was utilised successfully for eighteen years. The approach combines the ancient wisdom of yogic science with the precision and innovations of the West. We believe, the human potential of each person is infinite -- body, mind and spirit interconnected. The structure of the training is didactic and experiential it includes specific Kundalini yoga sets, breathing exercises, meditation, nutritional therapeutic formulas and recipes with a specific detoxification and rehabilitation diet. Specific therapeutic juice blends will be served each day to directly experience their healing properties and potent effects. This training is open to everyone - particularly anyone working in the field of addiction - yoga teachers and practitioners, healthcare professionals (psychologists, social workers, nurses, doctors and counsellors) and anyone on their own personal healing process or seeking a renewed change in lifestyle. SuperHealth® is approved in the USA by the National Certified Commission as an Educational and Training provider and awards CEUs to addiction professionals and counselors by NAADAC and the State of California Board of Sciences for MFTs & LCSWs. Introduction: History of SuperHealth® and yogic philosophy as it pertains to the pressures and stress of modern day times. Yogi Bhajan DVD on “Elimination of Anger and Fear”. The Addictive Personality and Exploitation of Hope. Science of Addiction: The effect on the brain, nervous and glandular system from marijuana, crack cocaine, alcohol and tobacco. Therapeutic formulas and specific perspectives to combat urges, cravings and address physical breakdown and mental trauma. Discuss application of these therapeutic techniques in professional practice and clinical settings, in private life, for self-help, and as a teaching tool. Touching the Human Spirit – protocol and caliber for authenticity and heartfelt compassion. 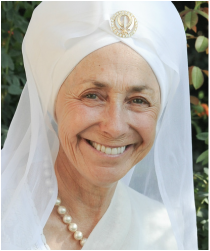 Trainer: Mukta Kaur Khalsa, Ph.D., Director of SuperHealth®, personally trained with Yogi Bhajan for thirty years and worked closely with him serving as Secretary of Foreign Affairs. Director of specialised hospital in Tucson, Arizona for eighteen years which received the highest commendation; rated in the top 10% of all programs in the United States by the Joint Commission on Accreditation of Healthcare Organisations. Mukta can help you understand how physical ailments parallel spiritual challenge and opportunity. Consultations incorporate yogic counseling, diet and nutrition, clinical knowledge, Kundalini Yoga and meditation, to create permanent positive change in your relationships, health, career or spiritual path.